The dive site Long Beach (Simon's Town) is a shoreline sand bottomed site with scattered wreckage and reef areas in the Simon's Bay area on the False Bay coast of the Cape Peninsula, part of Cape Town in the Western Cape province of South Africa. At first glance the site seems bland, but careful investigation will reveal interesting and varied life. A surprising variety of fish not commonly found in the region has been sighted here on odd occasions. There are several small wrecks and old mooring tackle to liven up the scene and provide artificial reef. This is the place to go when conditions are bad elsewhere, a popular training site, and great for getting new equipment configurations sorted out. There is an underwater trail for compass navigation training. 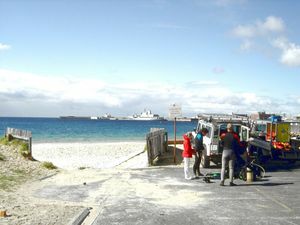 The site may occasionally be closed for diving when foreign warhips are in Simon's Town. 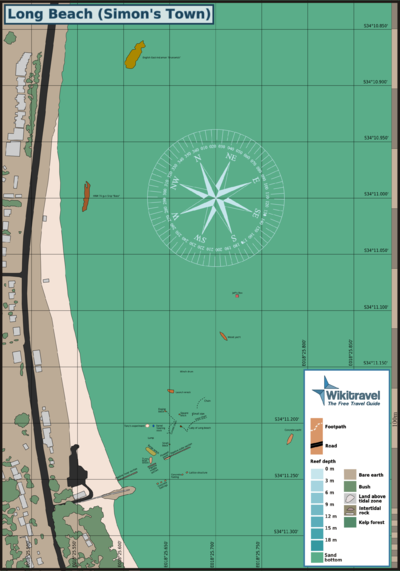 S34°11.239’ E018°25.574’ (at the “Slipway” shown on the SAN chart). Behind the Simon's Town railway station. This is in a Marine Protected Area (2009). A permit is required. The name "Long Beach" is derived from the stretch of sandy beach at the site. The bottom shelves gradually down from the shore to a depth of 18m at the Simon's Town Harbour mouth, 5m is reasonably close inshore, and about 9m at the maximum distance that the average diver is likely to swim. Visibility may vary considerably with the season and recent weather conditions, but is usually between 2 and 8m. If it is less then it will usually not be worth diving. When it is more, it is usual to dive at one of the other sites, but occasionally there have been reports of visibility exceeding 15m. Visibility in winter is on average better than in summer, but exceptions do occur. Flat sand bottom with occasional lumps of growth on loose rocks, wreckage and other artifacts. There is a pipeline perpendicular to the shoreline near the wall at the south end of the beach, which is visible in the aerial photo, and a wreck of a small steel barge just north of this pipeline. In 2009 a sportsfisherman sank at moorings in the bay during a storm and drifted alongside the barge wreck, where it broke up and came to rest between the south end of the barge and the offshore end of the inshore section of pipeline. Only the bottom structure with engines, gearboxes and shafts and various smaller pieces of loose wreckage remain. Further out along the pipeline are pieces of wreckage of a small sailing yacht, including the ballast keel and the lower portion of the hull. 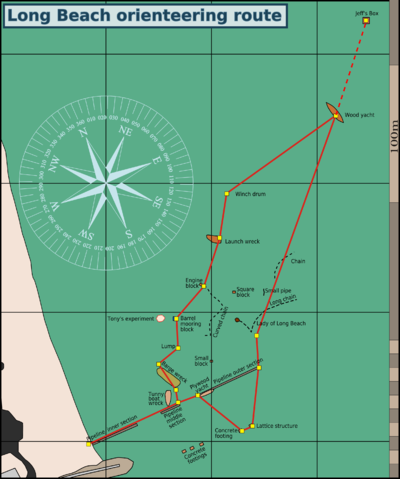 Further south is an obstruction shown on the chart, which is the wreckage of a tubular steel structure and some large concrete footings, possibly the remains of a jetty. Assorted artefacts are strewn randomly around the bay, as a result of centuries of mooring and occasional wreckings. Most are junk, but there will be objects of archaeological value which should not be disturbed. There is the bottom of a wooden yacht hull 220m north east of the barge bearing 057°magnetic. The bottom appears to be copper sheathed and most of the timber has rotted away. The wreck is about 11m long, 2m wide and 1m high, and the bow points towards 160° magnetic. Another wreck at S34°11.172' E018°25.652’ is the remains of twin screw wooden launch, Some bottom structure remains including keel bolts and stern tubes, There are also assorted mooring blocks and chains, some of them probably quite old, and usually heavily encrusted. To the east is the wreck of a ferroconcrete yacht at S34°11.239' E018°25.715', which is about 74m bearing 140° magnetic from the seaward end of the pipeline. The hull lies on the sand, but new orientation has not yet been surveyed. Length approximately 12m, beam about 3m, depth about 2.5m rough estimate. Side decks, quarterdeck and foredeck also ferroconcrete, but superstructure is gone and the hull is open from above. Mast support pillars look like steel tube. The yacht was probably ketch rigged, or maybe schooner. A bumkin or stern platform is partly present on the starboard side of the transom. The hull has a long keel, small vertical transom, and spoon bow. The hull is quite fair, and largely intact. Frames are mostly intact but angle iron floors have mostly rusted away. The hull seems to be sheathed on the outside with fabric, which could be glass woven rovings or cloth. The site is very well sheltered from westerly winds and swell, and fairly well sheltered from south easterly wind and waves. The site is almost always diveable, soit is very popular as a training site and for night dives. This is the place to go when everywhere else is a mess and you really want to dive, but it is usually at it's best in winter when the wind is not often from the east. Conditions will probably be unsuitable during strong south easterly winds, which mostly occur in summer. These will reduce visibility, and in extreme cases, produce high enough waves to be a hazard. The parking lot is tarred and generally adequate. There are public toilets and changing rooms of variable condition (frequently vandalised, sporadically maintained, sometimes closed) and fresh water showers which have on occasion been disabled by sawing the handles off the taps. The “Slip” at Long Beach, covered by sand, is at the gap in the wall, with Simon’s Town Naval Dockyard in the background. Easy shore access in most conditions. Beach entry to gently shelving sand bottom. Park at parking lot between Simon’s Town railway station and the beach. Turn east off the M4 into (road name) just to the south of the station. Entry and exit can be at any point on the beach to the north of the fence at the southern end, which is the border to naval territory. The beach is uniformly shallow shelving fine sand without reef or other obstacles, and the surf will be trivial in all conditions when it is worth diving. There can be quite a lot to see on the barge wreck, which provides a base for seaweeds and shelter for fish. Little clumps of sessile growth are based on the pipeline, red bait, other wreckage and debris, and loose rocks, mostly less than 0.5m diameter. There are extensive areas of sand with weed in the deeper water, some of it attached to the bottom, but a lot apparently loose. In some places there are beds of strap caulerpa, and where red-bait has rooted itself in the sand, little clumps of other organisms gather, including large numbers of Common feather stars. Large numbers of Warty pleurobranch and Sand slug wander around, and at times there are quite a lot of sea hares. A wide variety of fish have been seen at this site, including several not normally found in the Western Cape, which are carried down the east coast by the currents, and the eddies bring them into False Bay, and for some unknown reason, they often end up at Long Beach. Seals are fairly common, and Southern Right whales also occasionally come into the bay and have been seen during dives at Long Beach. The wreck of a ferroconcrete yacht. Large lengths of large link mooring chain, some with old engine blocks attached. A large anchor, which has been found by several people, but no-one has recorded its position. The wreckage of a wooden hulled twin engine sportsfisherman. The side produces occasional surprises. If you have a camera with you, you get to take the photos. Wide angle or macro lenses are most likely to produce good results. Natural light is usually sufficient as it is shallow, but flash will bring back the true colours. External flash is essential for anything further than about 300mm as there is usually significant suspended matter which will cause backscatter with internal flash. Most dives at this site include the barge, and many are more or less at random, or a circuit of some kind based on a compass course, as the landmarks are fairly far apart. Find the inshore section of pipeline that starts about 10m north of the fence at the south end of the beach. The first signs will be rectangular concrete blocks in a row parallel to the fence The pipeline starts fairly shallow and runs out approximately parallel to the fence. Swim about 70m at 089° magnetic out to the east end of the inner pipeline. This is at the end of a section of pipe and there are no blocks beyond this point until the outer section. Swim 22m at 024° magnetic to a mooring block (200 litre barrel full of concrete). Swim 30m at 033° magnetic to a cast iron winch drum (0.6m high and wide). This object is not easily recognised as it is heavily encrusted, but it is the only object of this sort of size in this vicinity. Swim 96m at 079° magnetic to a the wreckage of a small wooden yacht (about 10m x 2m x 1m). It is lying upside down on the sand, with the copper sheathing on the bottom uppermost. (optional visit to Jeff’s Box or skip to waypoint 13) Swim 72m at 043° magnetic to a large rectangular steel box with a couple of holes in it. It is about 3.5m high, about 4m long and 2.5m wide and is unmistakeable. Return to the wooden yacht wreck 72m at 223° magnetic. Swim 168m at 224° magnetic to the kink near the middle of a long chunk of very heavy mooring chain (about 44m long). The chain lies roughly east-west and is hard to miss. The kink points to the south, and at the western end there is a large object which may be an engine block. Swim 41m at 210° magnetic to the east end of a collapsed concrete and steel pipe structure (about 6m x 2m x 2m). Swim 9m at 268° magnetic to a large stepped square concrete foundation block (2m x 2m x 1m). Magnetic influence of the steel structure is significant, but by swimming anticlockwise around the structure you should see the block off to your right. Swim 43m at 328° magnetic to the west end of the outer pipeline section. 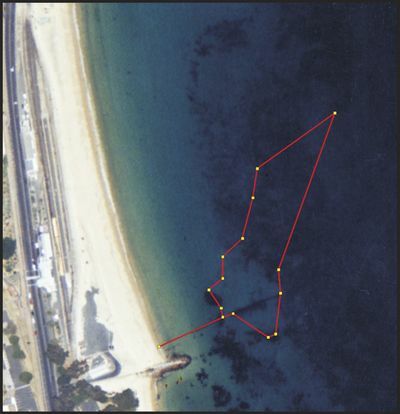 Swim 71m along the pipeline to west end of the inner section and surface. This section has gaps and parts may be buried under the sand. Maximum depth is about 9m at the yacht wreck (10m at Jeff’s box). Average depth of water on the route is probably about 6m. The positions of the landmarks have been surveyed by GPS. Accuracy should be within a few metres. Legs 1 to 8 as for the long route will take you to the launch wreck. 9. Swim 77m at 184° magnetic to the kink near the middle of a long chunk of very heavy mooring chain (about 44m long). This is the same chain as in point 13 above. Calibration leg for distance: To calibrate kick counts swim along the outer pipeline which is 52m long and record the number of kicks required. Swim back and record the number of kicks for the return leg. This should be the same or very similar. Add the two and divide by total distance of 104m to get your distance per kick count. This will vary depending on your speed, trim, posture, equipment, and style of finning, so try to be consistent and fin at a reasonable speed that you will be able to maintain for the longest leg which is about 170m. If in doubt, or for your own information, try swimming the calibration leg at different speeds to see what difference it makes. Do not expect great precision, but you should be able to get consistency within 10% with a little practice. To find the outer pipeline section, start as for the navigation route and find the inner pipeline section and follow it to the west end. Swim about 11m at 095° magnetic to the start of the outer section of pipeline. If you have no idea of your kick distance, work on about one kick count of both feet to the metre and at the end of 11 counts the outer pipeline should be visible. If not, continue for another 5 counts and look again. The bay is home to the False Bay Yacht Club, so not all boats will give audible warning of their approach. Being hit by the keel of a sailing yacht is to be avoided. Bluebottles (Portuguese man o' war) may be driven into the bay by south easterly winds. No special skills are required. The site is popular for training exercises and night dives, and is recommended as a site to test out new equipment configurations. It may be classed as confined water for some purposes. There are few landmarks, and though it is difficult to actually get lost, a compass is a convenience for keeping some idea of where you are, as the bottom shelves very slowly. If you plan to go far from the beach it may be advisable to tow an SMB to let boats know where you are, or at least carry a DSMB in case you need to surface far offshore. This page was last edited on 25 February 2012, at 09:15.